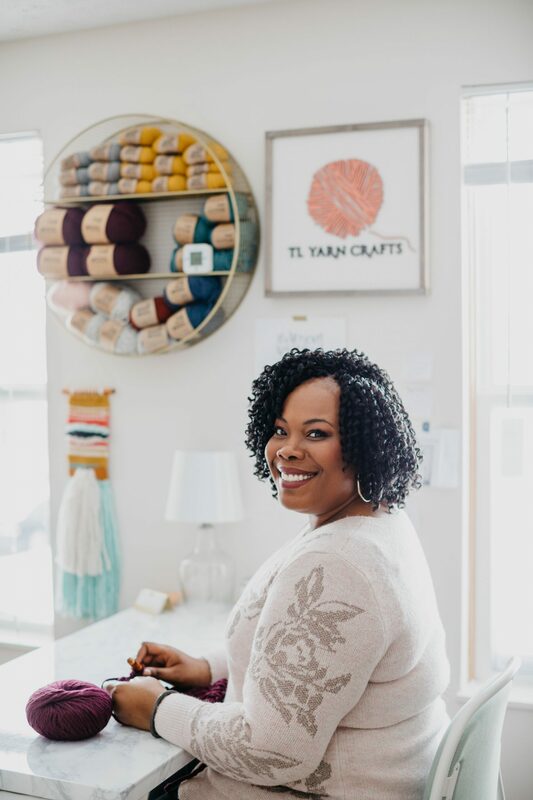 **Update** The Sweater Weather Cardi is now available as a kit from Lion Brand, including a printed pattern and all the yarn you need. Click for your kit! 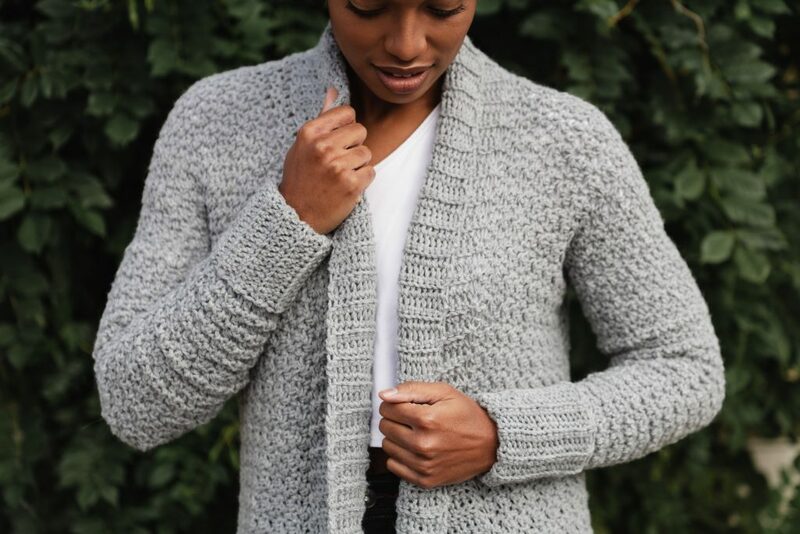 Addictive stitches and thoughtful design elements come together to make the ultimate mid-Winter layering sweater, the Sweater Weather Cardi! Thanks to my friends at JOANN, this latest collaboration brings in the chill of winter with style. Getting to wear layers is one of my favorite parts of ushering in cold weather. In the past, I’ve had my Veronica Cardi and Astrid Ruana to keep me warm. 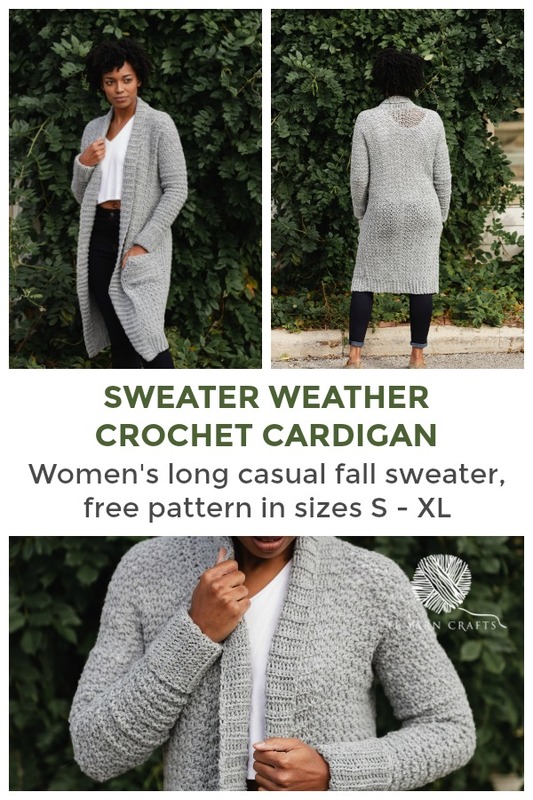 I’m so excited to add the Sweater Weather Cardi to the lineup, especially as a FREE PATTERN! 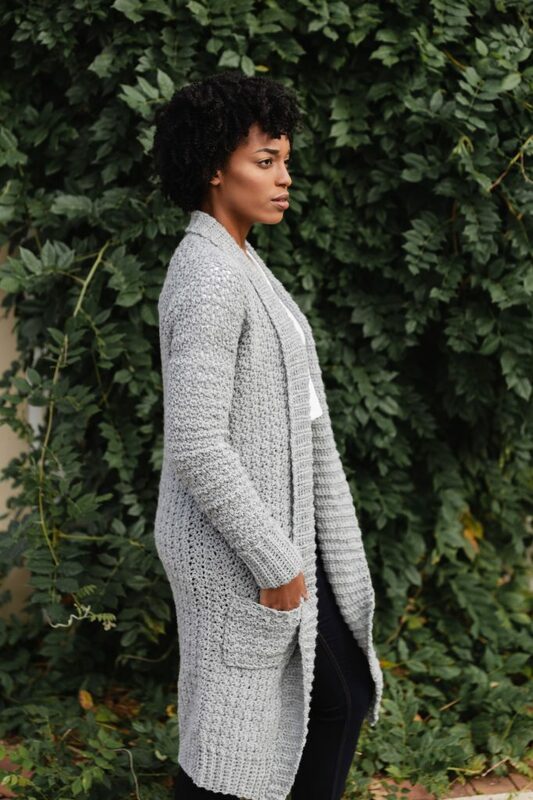 **UPDATE** The Sweater Weather Cardi is now available as a kit from LionBrand.com, including a printed pattern and all the yarn you need! CLICK HERE FOR YOUR KIT! Find a printer friendly, PDF version of the Sweater Weather Cardi in my Ravelry shop and on TLYarnCrafts.com. PDF version includes full-color, 6 page instructions and helpful schematic with no watermark. Fall is a crochet designer’s favorite season. We can finally start playing with warm, heavier weight yarns and incorporating long silhouettes into our maker library. 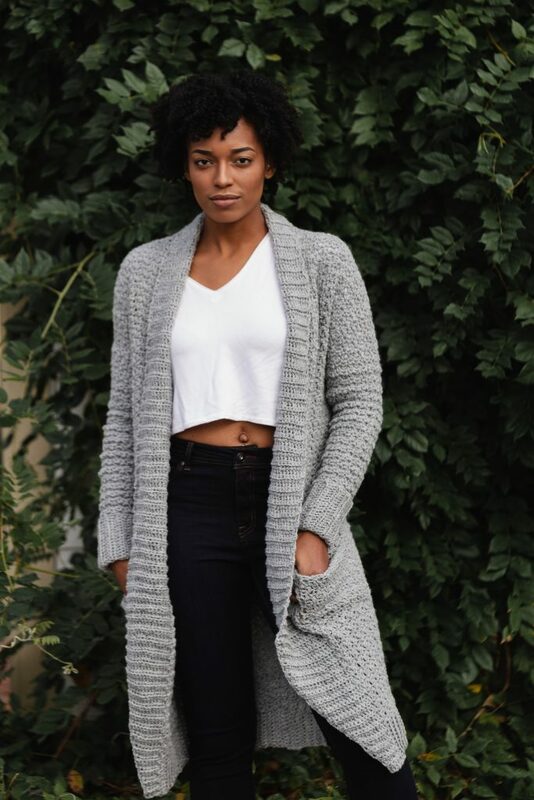 I saw some really cute long cardigans while shopping at one of my favorite trendy clothing and thought this was the perfect time to design my ideal cardigan! I made a long list of what I’d want my ideal cardigan to look like: long length, a wide, dramatic collar, solid color, pockets (of course! ), and plenty of texture. Thus, the Sweater Weather Cardi was born! The Sweater Weather Cardi is the kind of piece you’ll never want to take off. We’re in the midst of the holidays right now and I think this is the perfect piece to wear to endless family gatherings. Style it with a graphic tee, jeans, and booties for casual Friday at work or a coffee date with your best girlfriends. The Sweater Weather Cardi is meant to be the piece you reach for time after time! 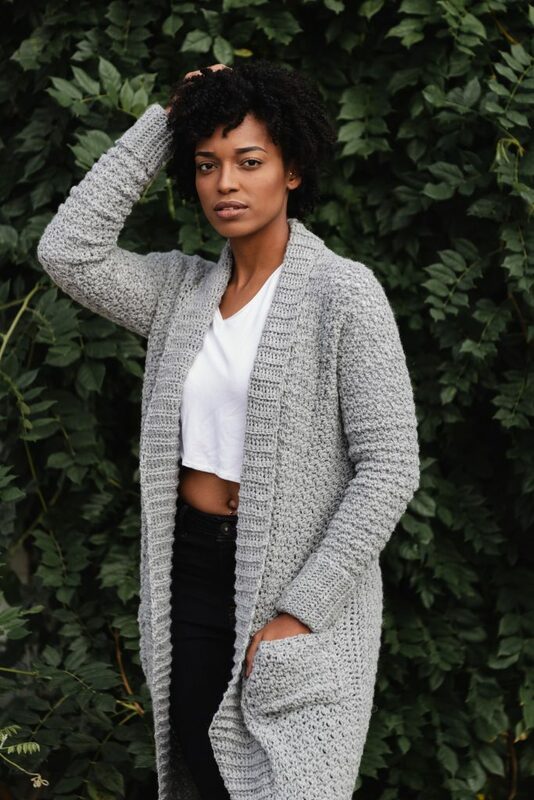 The textured body of the Sweater Weather Cardi is constructed from a simple single crochet / double crochet stitch pattern called the Lemon Peel stitch. It adds visual interest while still being light and flexible. The entire garment is built off of a base of two panels joined with a center back seam. Long cuffed sleeves are added next, along with cute pockets meant to hold your cell phone or wallet. Finish off this project with ribbing along the collar and bottom hem using my applied ribbing technique. You can watch the video for that handy technique here. I’m often asked about my favorite yarn. It’s impossible to say what single yarn is my favorite, but there are a few staple yarns that I reach for when I’m designing. One is Lion Brand Wool-Ease. 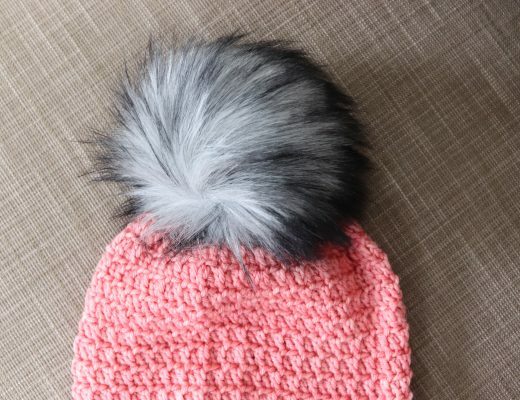 I used it design the Sweet Gingham Baby Blanket and it’s a perfect substitute to add some luxury when making the Mega Pom Beanie. It was the perfect choice for the Sweater Weather Cardi and I found all of the gorgeous yarn I needed at my local JOANN Store. Depending on the size you make, you will need between 8 and 11 balls of Lion Brand Wool-Ease. My original sample is made in the color Grey Heather, a soft grey color that looks great with everything. (Get this exact kit from Lion Brand right now! Click here!) If I made the Sweater Weather Cardi again, I’d choose the romantic Dark Rose Heather or the woodsy Forest Green Heather. From the first day I started designing pattern, I’ve included testers in the process. Each tester group is a bit different and includes makers of all skill levels. For the Sweater Weather Cardi, I had 10 testers (my largest group yet!) and each one did an amazing job on her sample. 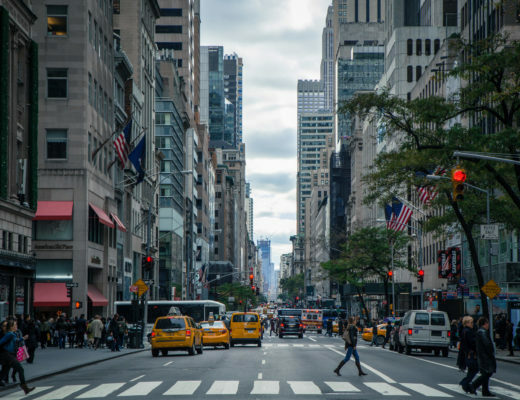 I was lucky to find a group of generous testers via my private tester group, TLYC Insiders group(click to apply if you’d like to test TLYC patterns!). Please click their links below and show them some love on their amazing finished Sweater Weather Cardigans! 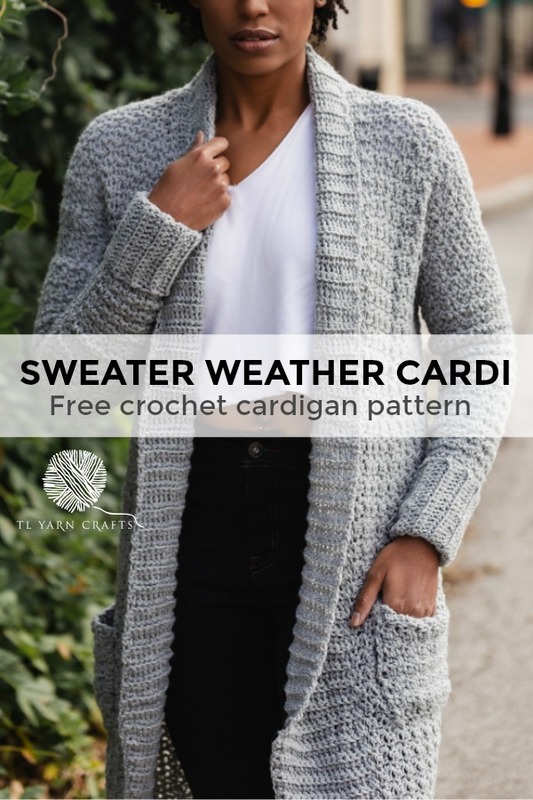 Click here for the Sweater Weather Cardi pattern kit from Lion Brand! Note: This garment was designed with approximately 0-2” of positive ease. Please take this into consideration when choosing your size. Pattern is written for size S with other sizes in parenthesis (M, L, XL). For some sections, instructions for sizes may be written separately. Follow directions only for the size you are making. Portions of the pattern are written in crochet shorthand. 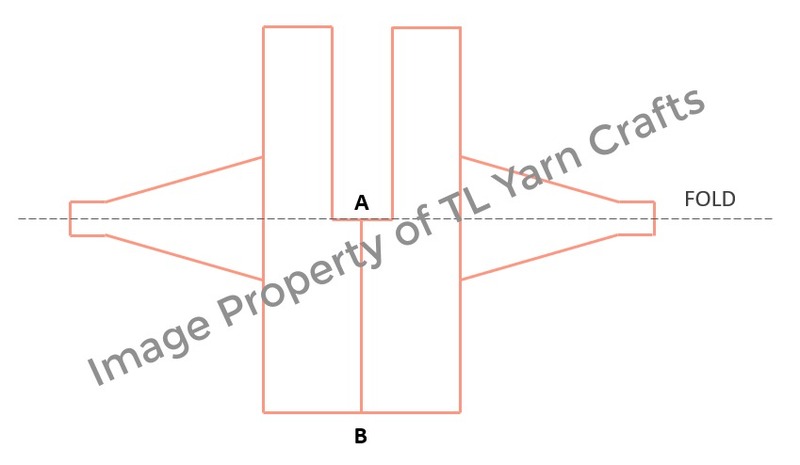 For example – “sc 1” means single crochet in the next stitch and “dc 1” means double crochet in the next stitch. Numbers in parenthesis at the end of some rows indicate the total number of stitches in that row. The finished garment may grow after blocking. To adjust the length of the Body, add or subtract foundation single crochet stitches in multiples of 2 and make necessary adjustments at Body Panels Next Row. Some makers may need to adjust the sleeve measurement for length. Add/subtract rows as needed while crocheting. STEP 2: Ch 1, sc BLO across row, turn. STEP 3: Rep Step 2 until piece measures 24 (28, 30, 32) rows total. ROW 1: Ch 1, sc 1, dc 1, inc, dc 1, (sc 1, dc 1) across row to last 2 sts, inc, dc in last st, turn. ROW 2: Ch 1, (sc 1, dc 1) across row, turn. ROWS 5-12: Rep row 2. ROW 13: Rep row 1. ROWS 14-21: Rep row 2. ROW 22: Rep row 1. ROW 23-30: Rep row 2. ROW 31: Rep row 1. ROW 32-39: Rep row 2. ROW 40: Rep row 1. ROW 41-44: Rep row 2. Cut yarn, leaving a long tail for sewing the seam later. ROW 1: With 6.5mm hook, FDNsc 196 (202, 208, 214), turn. ROW 2: Ch 1, sc BLO for 10 (10, 12, 12) sts, (sc 1, dc 1) across row to last 10 (10, 12, 12) sts, sc BLO rem sts, turn. Repeat Row 2 until piece measures 7 (8, 9, 10)” from first row to working row in (sc 1, dc 1) stitch pattern. NEXT ROW: Ch 1, sc BLO 10 (10, 12, 12) sts, (sc 1, dc 1) for 88 (92, 92, 96) sts, turn. Mark first st of this row. NEXT ROW: Ch 1, (sc 1, dc 1) across row to last 10 (10, 12, 12) sts, sc BLO rem sts, turn. Rep last 2 rows until piece measures 1.5” from marked row to working row (do not move marker). Cut yarn, leaving a long tail on one panel for sewing the back seam. STEP 3: Rep Row 2 until piece measures 14 (14, 20, 20) rows total. NEXT ROW: Ch 1, (sc 1, dc 1) across row, turn. For S and M only, rep Next Row 9 more times. For L and XL only, rep Next Row 14 more times. Cut yarn leaving a long tail for sewing to cardigan. Use the schematic below as a reference when assembling your garment. Remember that the schematic is not to scale. STEP 1: Seam Body Panels from Point A to Point B. STEP 2: Seam sleeves to Body Panels, joining the midpoint of the sleeves with the midpoint of the Body Panels. STEP 3: Fold where indicated, with WS facing out. STEP 4: Starting at the bottom of garment, seam sides and sleeves with remaining tails. STEP 5: Turn so RS is facing out. Attach pockets at desired height with ribbing on top. ROW 1: With RS facing and 6.5mm hook, join yarn at bottom of right Body Panel, ch 5, sc in 2nd ch from hook and next 3 sts, sl st in next 2 sts of Body Panel, turn. ROW 2: DO NOT CH! Sk 2 sl sts, sc BLO across sc sts, turn. ROW 3: Ch 1, inc BLO, sc BLO across row, sl st in next 2 sts of Body Panel, turn. ROW 32: DO NOT CH! Sk 2 sl sts, sc BLO across sc sts, turn. ROW 33: Ch 1, sc BLO across row, sl st in next 2 sts of Body Panel, turn. Rep Rows 32 and 33 until you reach Point A (see schematic). Cut yarn. With WS facing and 6.5mm hook, join yarn at bottom of left Body Panel. Rep all Right Body Panel instructions for opposite side of garment opening. Cut yarn leaving a long tail for seaming the collar. Weave in all ends. Lightly steam block entire piece if desired. 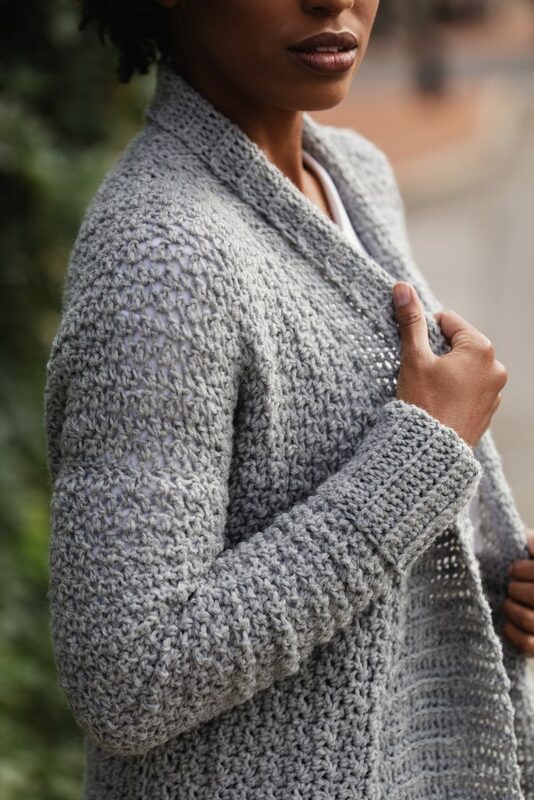 Purchase the printable PDF Sweater Weather Cardi pattern HERE! I hope you had as much fun making the Sweater Weather Cardi as I did making the design! I can’t wait to see all of your projects! 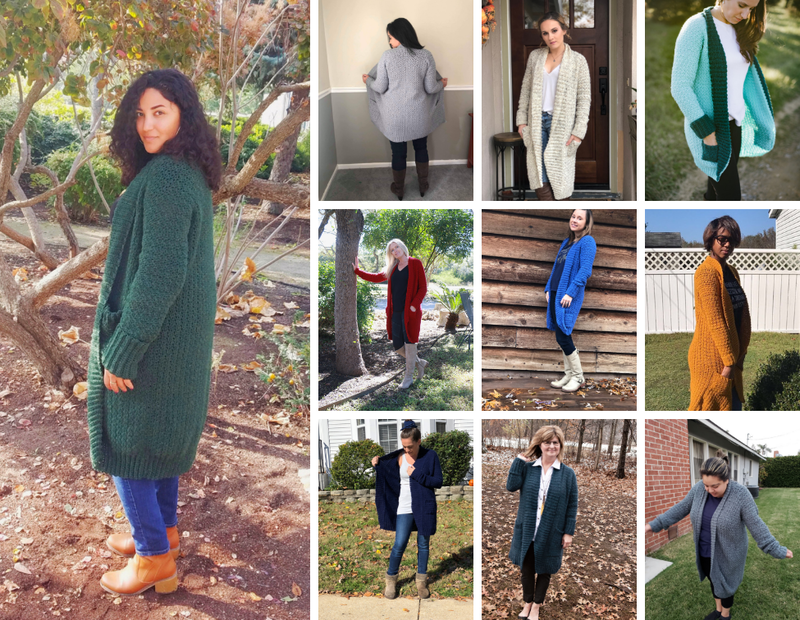 Share them with me on Instagram and Facebook using the hashtags #SweaterWeatherCardi and #TLYCMakers for a chance to be featured in my feed. Comment below and let me know what color you’ll be using for your Sweater Weather Cardi! Update: I can’t get enough of this Sweater Weather Cardi made by Janine of @knitsnknotswpg! Share this Pin image now! I’m working on it but have a question for the panel do we start the Fdsc with the thinner hook and the Blo also and then shift for the larger one with the sc/dc ? Hi Dina! You’ll do the panel stitches and the ribbing with the same hook – the 6.5mm hook. The 7mm hook is only used on the sleeves. Hi there, I am currently making the sweater weather crochet cardigan and when I go to seam the body panels together I have a right side facing out and wrong side facing out. What have I done wrong? Hi love! The body panels are made identical, so there is no right or wrong side. Hope that helps, and feel free to email [email protected] if you have more questions! Hi Toni! I’m just finishing up my second sweater weather cardigan and I have to tell you that I absolutely LOVE your patterns. Your such a brilliant designer, so, so talented. I recently purchased your flat iron shawl as well and I can’t wait to get going on that one either. I am sure it won’t be long before I work through your whole library! 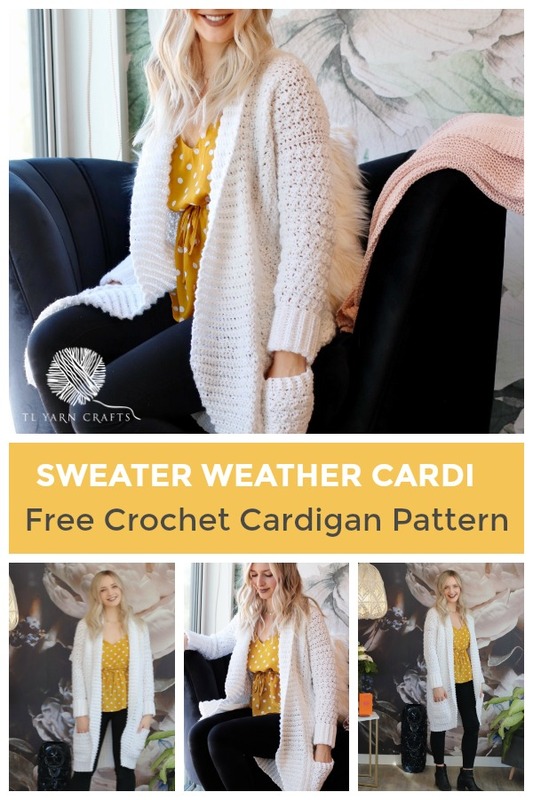 Thank you for sharing this pattern, it is one of my Favorite crochet cardigans! I wonder if this could be made using Tunisian crochet? I’m getting pretty confident with Tunisian, but regular crochet is still not clear to me (I know, I’m a bit backwards, lol!). It sure could, Lorraine! You’d have to do a bit of math, but I bet you could make it work! Thank you, Toni! One more question: what adjustment(s) would I need to make if I want to make the sleeves (upper arm part) wider? Are there any instructions to make this larger, like a 2X or 3X? Hi Heather! There are no instructions in the current pattern to make this larger, but you could use the gauge of the pattern to adjust it for the size and length you need.